We have been making house calls since 2001! Hiring a professional pool service company protects one of your most valuable investments-your pool and/or spa! Keeping the equipment working properly and the water chemistry balanced allows you to enjoy your pool or spa instead of chasing down chemicals, educating yourself, and making time for maintenance. We take great pride in taking care of your pool for you and your family. Our knowledgeable staff keeps your pool clean and safe and performs the following tasks to ensure your pool is clean and sanitized: Weekly monitoring and maintaining of pool water chemistry, brush pool walls, skim water surface, and clean waterline tiles, backwash filter, vacuum pool floor. One of the many advantages of our Pool Maintenance Program is that our maintenance technicians are backed by our Service Department. We not only keep your pool sparkling clean, but we also can repair and replace your pool equipment as needed. Our team of experts makes sure you get the quality service you expect from a swimming pool service company. Plans are for screen enclosures 15’ x 30’ pools or smaller. Plans are offered for larger pools, as well as open pools. Please call for pricing and information. We can customize a plan to fit your individual needs. We service some of the largest commercial properties in Collier and South Lee Counties. Our business is set up to handle the pool service needs of hotels and property management companies. We are familiar with the management process, carry the proper pool service licenses and insurances required by most commercial facilities and are familiar with the Florida Department of Health swimming pool requirements and processes. Our commercial route technicians are Certified Pool Operators as required by the State of Florida. We can be reached either by e-mail, fax, or telephone to meet your needs. Problems inevitably arise and the difference is that we are easy to reach and ready to take care of them for you when they do. Please call our office for service pricing. Whether you are buying or selling a home, it is important to have the property’s swimming pool properly inspected by a professional swimming pool inspector. Most home inspectors are not qualified to perform a swimming pool inspection, which can lead to surprises at closing for sellers and unexpected expenses for buyers down the line. 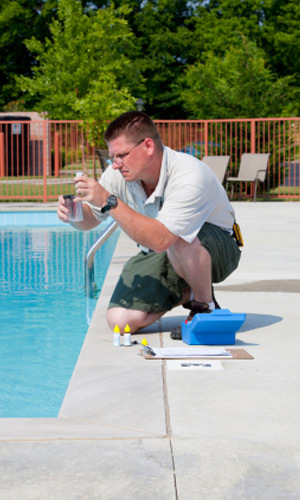 Our team is available to perform pool inspections throughout Collier and South Lee Counties. Never completely drain your pool. You do not need to lower the water level in the pool, but if you decide to, be sure to close your skimmer valve to prevent damage to the pump when the power is turned on. Turn off all electrical power to the swimming pool pump, motor, lighting, chlorinators, etc. If your filter pump is in an unsheltered area, have the motor removed and stored or wrap the motor with a waterproof membrane or plastic bag and tie it securely in place to prevent sand and driving water from entering the motor. Remove all loose items from the pool area. It is not advisable to throw patio furniture or accessories into the pool. If it is necessary, however, remove them as soon as possible after the storm has passed. Heavy furniture may chip and damage the pool finish and the chemicals in the water will damage it. Add extra chlorine to your pool to prevent contamination. The pool provides a handy source of water for washing and flushing if your house water supply fails. If your pool area is screened, you may prevent costly damage to the frame structure by removing 1 or 2 panels of screen above the chair rail on each side to allow the wind to blow through. Don’t remove the lower panels or panels overhead. Slip the pins out of the door hinges and place the doors in a protected area. DO NOT EMPTY THE POOL! High ground water can cause structural damage to an empty pool. There is a very good chance that your pool will lift right out of the ground if you drain it after heavy rains or floods or when the water table is high. Super chlorinate the pool water. When the chlorine residual returns to normal, have the water tested for proper balance. Heavy rain upsets mineral balance needed for protection of your equipment and pool finish. Remove all debris from pool with a leaf rake and a skimmer before restarting the system to prevent clogged lines. Some chemical feeders require special care before starting the pump motor. Check with your pool company. Remove any wrapping around the pump motor. If the motor has been submerged, it should be removed for professional cleaning and drying. If the pump has remained dry, turn on the electricity. Check to take sure the pool is operating normally and that the water is circulating in the pool. Reset time clocks to show the correct time of day. Run the filter until the water is crystal clear and resume normal pool operation. If you experience pool systems failures after the storm, call us and we will do our best to get your pool up and running. Summer mold and mildew ruining the look of your pool deck? 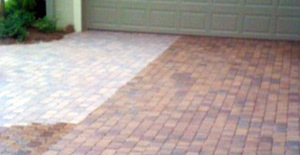 Our Pressure Washing and Sealing Services include: driveways, sidewalks, patios, pool decks, pool cages, whole house (except roof), and more. Florida Pool Service utilizes the highest industry standards to achieve optimum results. Pressure washing provides a solution against the potential health hazards caused by mold and mildew, and is more cost effective than an expensive remedy later. Call today for details and pricing! The simplest way to determine the need for an acid wash is to decide if your pool is not the same color it was when you had it built. Lots of things will change the color of your swimming pool pebble such as algae, leaves, calcium buildup, and rust. 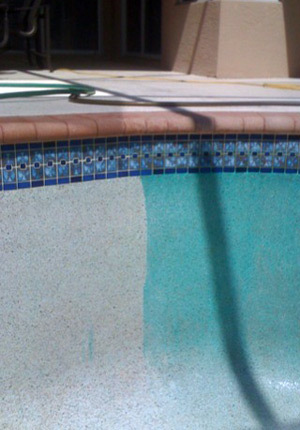 If you are dissatisfied with the appearance of your pool finish, an acid wash may be just what your pool needs. The main purpose of an acid wash is to remove stains, scale, and calcium from the floor and corners of your pool bed. If you are not able to see the walls and floor of your pool, then it may be time for an acid wash. Because the process of a swimming pool acid wash wears down a small amount of the finish we recommend that you only get it done every few years or so. You may also decide on an acid wash not because of swamp conditions, but just to bring out a brighter, whiter finish. An acid wash is always a dramatic aesthetic improvement. When we acid wash your pool we will start by draining the pool completely. This will give us a clear view of our work field. Remember, the process is time consuming but we are here to make it simple. Florida Pool Service is skilled and knowledgeable and has many years experience in performing a swimming pool acid wash. Call us today for pricing and to schedule your acid wash service.